Because many people we advocate for can barely afford their bicycle never mind an F350 landscaper rig. Everybody deserves to have an expectation of getting to work without being assured by elected representatives of death on public roads. Because streets that are safe for people on foot and on bicycles are safe for all users. Because brushing aside public safety is terrible public policy. Because admitting ignorance about how government works doesn't mean things are done in secret. Rather it confirms the ignorance. 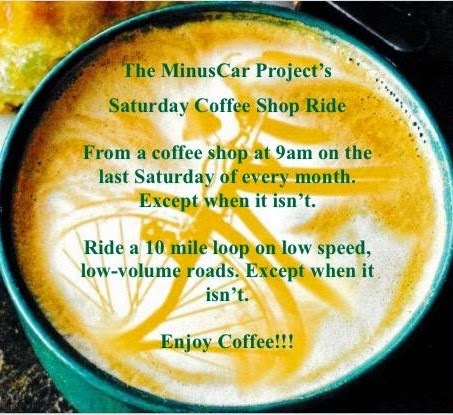 This Saturday October 10 morning from 7am to 9am I'm hanging out on Dakota Ave between 10th & 11th Streets, near the Argus Leader's loading dock. 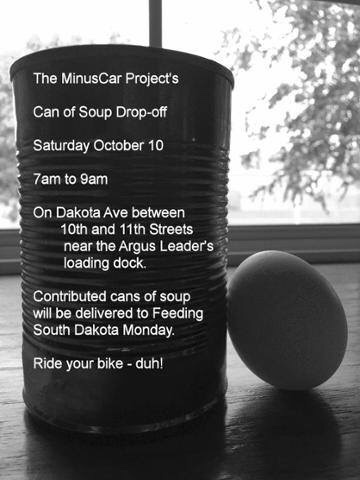 I'm inviting every sort of rider there is to come by and drop off a can of soup. The next Monday I'll deliver this soup to Feeding South Dakota. Sharing this picture increases the likelihood of participation.